Santa Monica’s Native digs deep into all sorts of roots. On the Wednesday morning of Christmas week, just like on every Wednesday morning, L.A. chef Nyesha Arrington went to the Santa Monica Farmers Market. Her close friend Alex Weiser of Weiser Family Farms was really stoked about Romanesco that day, so Arrington got some to create a special at Native, the Santa Monica restaurant she opened in November. Briar Patch Farm had beautiful Hachiya persimmons, which Arrington was excited to over-ripen and use for dessert. Even in Santa Monica, where you can find seasonal cooking at modern diners, Native stands out as a hyperlocal restaurant. Arrington lives, works and shops in the neighborhood while also venturing out to other farmers markets and supporting other local purveyors. “A lot of what we serve is based on what the farmers are excited about,” Arrington says. Native, as you might guess from its name, is a restaurant that’s inspired by the diverse cultures, ingredients and flavors of L.A. Arrington is black and Korean and recently discovered, after her boyfriend gave her an 23andMe ancestry kit, that she also has Japanese and Cherokee roots. And her cooking career includes gigs at JiRaffe, Melisse and Joël Robuchon’s Las Vegas restaurants, so she knows every classic French technique imaginable. The Romanesco special Arrington has been making is inspired by Mexican street corn and is cooked over open fire. The dish also involves triple-blanching garlic, a technique Arrington learned at Josiah Citrin’s Melisse. The dish also involves slow-roasting sesame seeds for tahini. Arrington remembers spending lots of time as a child in the kitchen with her immigrant Korean grandmother, Ai-Soon Lee, who would stress things like the importance of preparing sesame seeds the right way. Arrington’s food celebrates old-school home cooking and the joy of “being able to understand where your lineage comes from” while also weaving in fine-dining flourishes and modern technique. Her cooking is enhanced by “farmers and artisans who are passionate about their product” as well as the pleasure that comes from “connecting people at the table from a global standpoint.” Native is an L.A. restaurant through and through. The L.A.-born Arrington (who remembers being in her grandmother’s kitchen learning how to blanch vegetables and peeling five pounds of garlic as quickly as possible so she could go outside and play) creates comfort in the form of short rib “rolled” dumplings that transport her back to childhood in a way. At Leona, Arrington’s former restaurant in Venice, one of her popular dishes was lamb belly wontons created with wonton skins she purchased. At Native, Arrington wanted to create her own dough. Her classical training, which involved rolling out a lot of pasta dough, helped. Native’s dumplings, filled with braised and shredded short ribs and served atop the beef jus that results from preparing the dish, currently have a garnish of charred Brussels sprouts and cipollini onions. But that garnish, of course, will change seasonally. 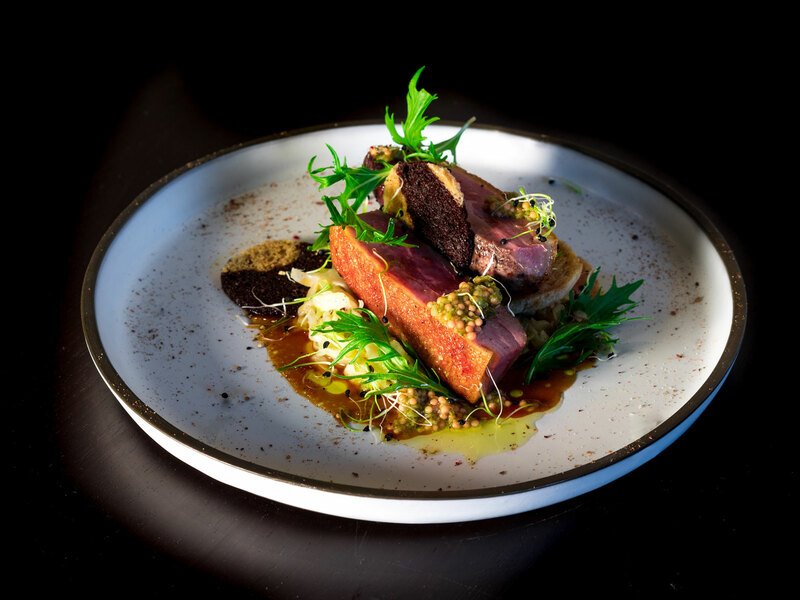 Other soul-hugging dishes at Native include pastrami-style roast duck breast with cabbage and marble rye tuile. It’s an entree Arrington decided to make because she loves eating pastrami sandwiches. Then there’s the chestnut spaghetti featuring an umami-rich stock made from mushroom stems. 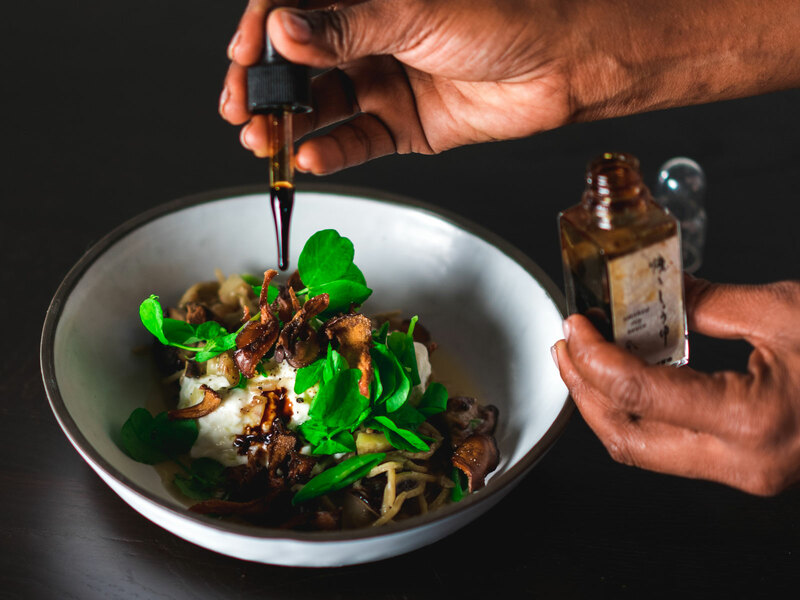 The umami gets dialed up another level with a mixture of mushrooms that’s headlined by shiitakes and then gets dialed up again when the dish is finished with several drops of aged soy sauce. scoops them out and serves them alongside a baked vanilla custard with tarragon oil. California winters, when 60-degree days make people crave baking spices while the market still has all kinds of gorgeous produce, allows chefs to have fun like this. When Arrington and I speak this week, she’s on the patio of her Santa Monica home, feeling the warmth of the January sun shining on her face, as she tells me about how it can seem a little weird to serve strawberries in the winter. But she found some glorious Seascape strawberries, so she decided to make a special strawberry dessert. First, she roasted the strawberries with some baking spices in a 200-degree oven for about 12 hours. Then, she took the spices out and used the roasted strawberries to create a granita with frozen Thai coconut water. It’s a dessert, Arrington points out, that makes more sense in Santa Monica than, say, Hollywood or Mid-City. Santa Monica has L.A.’s most prominent farmers market and it’s also a beachside community. It just feels right to have a refreshing dessert of strawberries and coconut at the new hyperlocal neighborhood restaurant.